Dr.Mohammad Javad Zarif is the Foreign Minister of the Islamic Republic of Iran in the administration of President Rouhani. He led the Iranian negotiation with the P5+1 countries, which produced the Joint Comprehensive Plan of Action on 14 July 2015, lifting economic sanctions against Iran on 16 January 2016, and bringing Iran back to the international community. The Deal has been praised by some as the most important multilateral agreement in decades. He also was instrumental in the negotiations for the Iran Nuclear Deal. 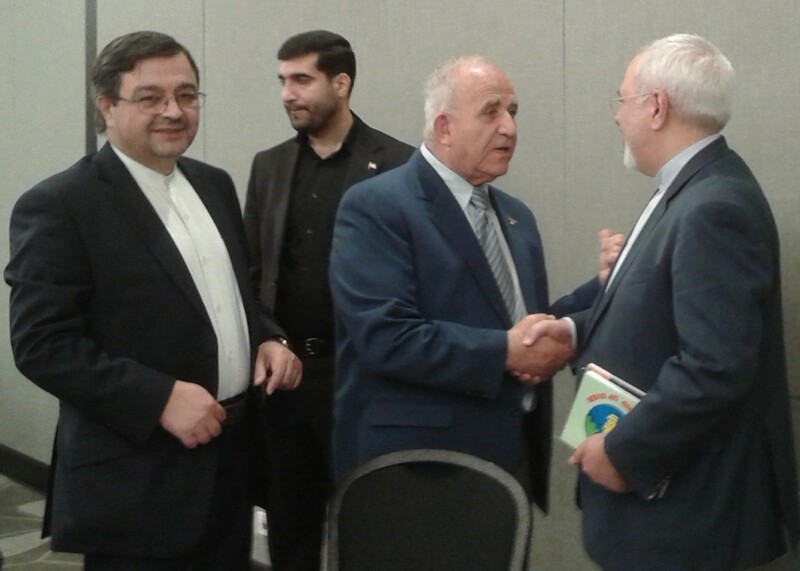 He is a career diplomat and served as Iran’s UN Ambassador from 2002-2007. He has written extensively on disarmament, human rights, international law, and regional conflicts. Javad Zarif and his American counterpart, John Kerry, Secretary of State, were top contenders for the 2015 Noble Peace Prize. Iran will always have a Nuclear Program, which will remain peaceful. Nuclear weapons will not led to security – they never have – they never will. The world should be free of all Nuclear Weapons. However, the US wants to keep the smoke screen of Iran as a threat, so that they can do their political agenda of war and regime change. Sanctions (and wars) are not the answer. The US has an “addiction” with sanctions and needs to quit. Before the sanctions, Iran’s dependence on oil was 50%, now it is 34%. The sanctions only made Iran more self-reliant. Talking with respect always works. According to International Law, where is the justification of Israel saying that it is going to bomb Iran or Netanyahu threatening Iran on a daily basis. And why does the US say all the time “all options are on the table” when talking to Iran. This means war – and in a war – everybody loses. We still have people dying because of the chemical weapons used by Saddam in the Iran-Iraq War. Furthermore, both the US and Iran must stop their rhetoric of “Axis of Evil” and “Great Satan”. With globalization and for the human race to survive, we need to define our problems differently, and we must have shared objectives – especially now with, ISIS. We need to work together to fight ISIS together. Nothing is a gain for one and a loss for another. The thugs and terrorists that make up ISIS are non-state activists and they are a problem to everyone in the region and the world. They must be stopped at the source. They are similar to a disease, such as, Aids and Ebola, and as a disease spreads rapidly and throughout the world so will terrorism. Iran is an important force in the region and will not leave. It is an Old Country with a Young Democracy. 70% of the people voted in the election for Parliament last month, and contrary to what most people think, religious minorities are represented in Parliament. Jews with a population of about 20,000 have one seat in the Parliament; Armenians/ Christians with a smaller population have 3 seats; and Zorastians have 1 seat. In regard to Iran’s military and launching missiles, Iran’s government doesn’t even spend 10 billion a year on weapons whereas other countries in the region spend much more. For example, Saudi Arabia signed a contract with the US for more than USD 100 billion for the purchase of weapons in the next 5 years. Iran has every right to protect itself and the right to test missiles, as long as they are not capable of carrying nuclear warheads. Iran has not started a war in 250 years and is a peaceful nuclear-free country. However, Iran will defend itself if it is attacked. During the Iraq-Iran War, 1980-1988, Saddam launched missiles with chemical warheads, and not one country in the region or the world came to the defense of Iran. The government begged for 1 Scud Missile to defend its people, but no one helped. Iranians learned the hard way that they must protect themselves. However, when Iraq and Saddam invaded Kuwait 2 years later in 1990, Iraq became the enemy of the West. The US led the Coalition of the Willing and US boots were on the ground to defend Kuwait from the monster Saddam. He was no longer the Darling of the West. I was born and raised in Iran and understand the culture and complexity of the Middle East very well. I became an American by choice in 1980. I have seen my birth country ruined by oil and foreign politics. It is difficult for me to witness my second country, America, which was my home for 34 years, possibly be damaged because of wrong foreign policies. I hope we can have peace in 2016 to stop further hardship in the Middle East and the world. My award-winning book, “The Power and the Peril of Oil,” describes the major players in oil, the power and the misery that came with it, the Middle East, division in Islam, and Iran’s nuclear facility, with helpful suggestions for peace. It is a well-researched documentary based on its reviews. The U.S. policy of “War Against Terrorism” has been a failure. Security has gone from bad to worse in the U.S., European countries and other places. We have more terror organizations than before the heinous attack on the World Trade Centre on 9/11. The way to fight terror, is by not creating any more. President George W. Bush’s Administration had plans to control the oil of the Middle East and Africa. Their policy failed but millions have been killed with many wounded in the process. “War Against Terrorism” and “Democratizing” other nations was a clever cover. There is no way to bring democracy to a nation with fighter-bombers from overseas; it has to come from within and by education not force. And, it will not work for every country. The decision by U.S. politicians to remove Bashar al Assad, President of Syria, is absurd and another attempt for control of oil. The U.S. politicians and mainstream media are deliberately making the public believe that they are bringing democracy to Syria, not mentioning that Assad was elected by his people democratically. Allegations about Assad are very similar to the erroneous claims made about the former presidents of Iraq and Libya, who were killed because of U.S. foreign policies. Syria is a unique Arab nation that has total freedom of religion. They had Sunnis, Jews, Shi’ites, Alawites, Kurds, Yazidis, and 1.8 million Christians living in harmony. Syrian women have the same rights as men to public offices, work, business, health, and education. Syrian women are not forced to wear the burqa. The Sharia (Islamic law) is unconstitutional in Syria. Syria is the only Arab country with a secular constitution and does not tolerate Islamic extremist movements. Syria was the only country that admitted Iraqi refugees without any social, political or religious discrimination. Contrary to “Fighting against terrorism,” The U.S. supports the Al Qaeda in Syria to oust Assad. It is not the job of any country to remove an elected president of another nation. This is illegal, immoral and against the United Nations’ charter. 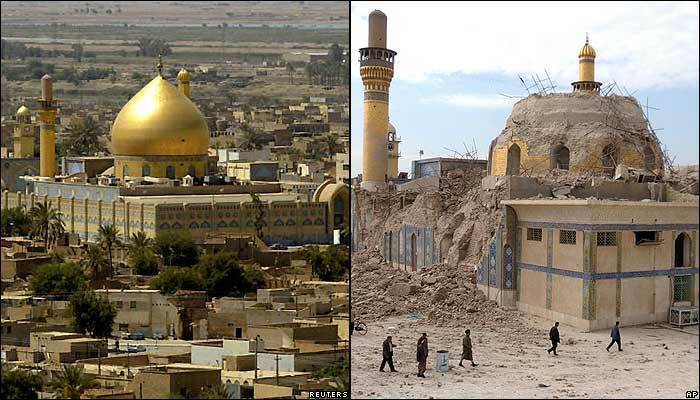 The U.S. occupation of Iraq, insurgency, terrorism, and executions has destroyed the country. They have democracy, but it turned into a human slaughterhouse! Removing Saddam was because of Iraqi oil, but it created ISIS. Saddam protected Iraq from terrorists, and Gaddafi made Libya the most advanced country in Africa. On the other hand, the Kings of Saudi Arabia have been America’s “best” allies; yet have the worst record on violations of human rights. They have beheaded more people than ISIS. The highest number was 151 during 2015. Saudi Arabia breeds and trains Wahhabi Jihadists. Osama bin Laden, Al Qaeda, and 15 out of the 19 hijackers of 9/11 were from Saudi Arabia. The 2015 San Bernardino terrorist couple were married and trained in Saudi Arabia to become Jihadists. But there is no drum roll for democracy or fight against terrorism with Saudis. It is oil and money! The U.S government in 2015 signed a one hundred billion dollar contract with the Saudis for weapon sales for the next 5 years. This is a good reason to say that, the land of the free and the brave has lost its soul and security for oil. The biggest risk with removing Assad is who will replace him. It very likely could be handing the country to ISIS. Changing Syria to an Islamic State would be a disaster! Leave the legally elected president of Syria alone. Stop the bombing of Syria to prevent more refugees into Europe and other countries. Support the Syrian military to defeat Islamic State. As of January 2016 the attempts of ousting Assad with strong allies that Syria has, such as Russia, Iran, and Hezbollah has not been successful, since 2011 with the huge financial and military support given to the opposing terrorists from the U.S., Saudi Arabia, Qatar, UAE, and Turkey. The situation only has made ISIS become stronger. They are selling oil on the black market earning more than $1.5 million per day. And many poor innocent Syrians have been killed, fled their country, or were forced to convert to Wahhabi Muslim under ISIS. President Putin of Russia has openly stepped-in to assist the Syrian government and to prevent ISIS from taking control of more territories and oil fields. It is up to the UN and powerful countries to join Russia to stop the expansion of Islamic State. Writing is my passion, and I want to make a difference. I hope that I can be instrumental in fostering peace in the world. If I sit silently, I have sinned. I feel a moral responsibility and hope that others will join me in this cause for peace. "The Journey: An Immigrant's Story From Tehran To Twin Lakes To Tasman Bay" is the true-life story of Firooz E. Zadeh, an Iranian athlete who left hardship and repression in his native country to live in America with his family. Proud of his Persian culture, and determined to achieve success, Firooz encountered an immense setback when the murderous September 11th attacks brought about a "Nation of Fear" cultural and political atmosphere in his adopted home, leading Firooz to emigrate once again for the welcome repose offered in New Zealand. An inspirational testimony of adapting to change and enduring great hardships, flavored with the wisdom of an individual who not only survived adversity, but also prospered, The Journey is a thoughtful and thought-provoking personal memoir of considerable literary and biographical merit.